Our poster for 2018 is brought to you by the talented students of the National Arts Honor Society of Northport Public School. Once again we are grateful to Ms Jenny Evans, our Art Teacher Extraordinaire, for her enthusiastic facilitation of the project and her continuing inspiration and guidance of our young artists. Our 2017 poster featured original artwork by ﻿Claire Brown﻿. She was the winner of a contest open to Northport Public School students challenging them to create an original piece of art that inserted classic cars into a well-known piece of art. The original artwork was then incorporated into a poster by McGuire Irvine who has done all of our design work and graphics for Northport Cars in the Park. Claire is a sophomore at Northport Public School. She lives in Northport with her parents, Brigitte Middleton-Brown and Robert Brown and her three siblings. Throughout her whole 15 years of life she has really appreciated art and creating things. She likes to paint and draw and plans to incorporate art into much of the rest of her life. She has chosen to adapt Café Terrace at Night by Vincent van Gogh for our 20th Anniversary celebration. Our posters in both 2015 and 2016 have featured original artwork by ﻿Robert Lennart Johnson﻿. The original artwork was then incorporated into a poster by McGuire Irvine who has done all of our design work and graphics for Northport Cars in the Park. McGuire Irvine is the grandson of founder George Irvine and has been doing the graphic arts for the dash plaques and top ten awards for Cars in the Park for several years. He started by taking drawings rendered by Darin Irvine and re-working them into digital versions appropriate for printing, making early use of his artistic and graphic arts talents. He has provided all of the graphic arts work for the car show since 2015, continuing to work with his father to create the posters, mailers and advertisements. He is an exceptionally talented young man, and we feel most fortunate that he continues to volunteer his time and talent to the car show, despite moving to Texas! After Bob graduated from art school in Detroit, he became an Industrial Designer, which was the focus of his studies. He spent a few years applying his talents in different fields; automotive, home products, and professional equipment being a few of those fields where Bob left his mark. Following those experiences, the field of Exhibit Design opened to him. Here was an opportunity to design projects that would explain products or processes in an attractive and illuminating environment. This was a demanding profession with high standards and short deadlines. And then, after twenty five years the frenetic career in Exhibit Design came to an end. Bob moved to Northern Michigan where he became involved in the Residential Construction Industry. Here he applied his design talents to Residential Building where he continues in that field currently. Beside all of these serious endeavors Bob always has time for some levity. He creates cartoons and elaborate greeting cards celebrating various events which have been appreciated by family and friends. 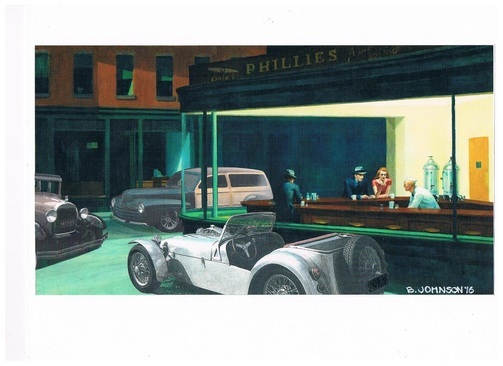 Bob has created for us an adaptation of the famous Seurat painting to celebrate the 18th Annual Northport Cars in the Park and an adaptation of Edward Hopper's Nighthawks for the 19th Annual Northport Cars in the Park.